The certification process can be confusing and complex. Our Essential Coach Training Program has simplified the path to certification. Successful completion of Essential Training and Associate Training meets the 60 hour training requirement and 10 hour mentor coaching requirement for the first level of ICF certification: Associate Certified Coach. The additional training hours completed can be applied toward the second level of ICF certification: Professional Certified Coach. 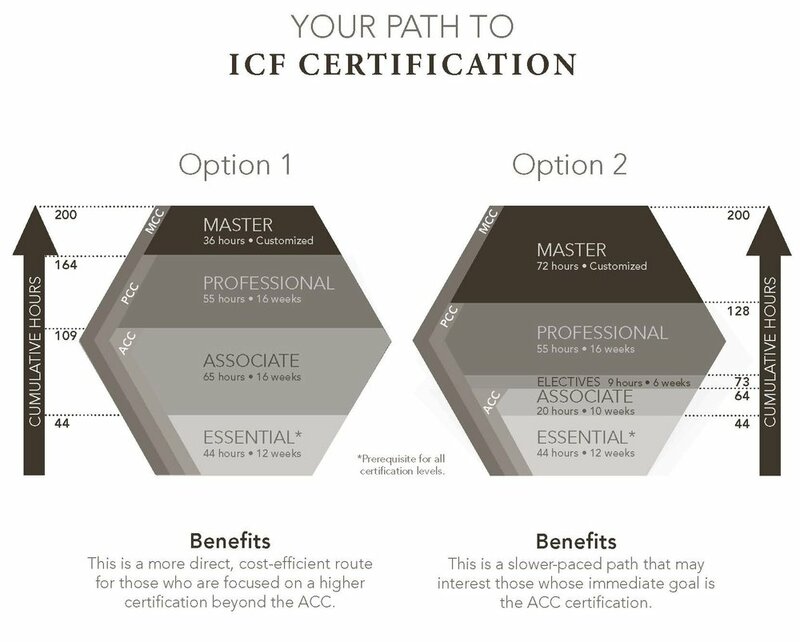 Successful completion of Option 1 Essential Training, Associate Training, and Professional Training exceeds the 125 hour training requirement for the second level of ICF certification: Professional Certified Coach. The additional training hours completed can either be applied toward a higher level of certification, or used as continuing education credits for ICF certification renewal. When you have completed the requirements for your particular level of certification, you will apply for certification with the International Coach Federation using the ACSTH path (Approved Coach Specific Training Hours). What kind of support can you expect to receive? From day one, the CCE team provides you with personal certification guidance. Throughout your training and even following completion of your training, we are there every step of the way! Call the CCE office at 612.246.4787 or request a free personal consultation to find out more about coach certification. Someone from the CCE team will get back to within 24 hours. What makes certification worth the time and perseverance? A credentialed coach demonstrates not only knowledge and skill, but also a commitment to high professional standards and strong code of ethics. A credential adds credibility to you as a coaching professional. How can certification benefit you? Your certification is additional assurance for your clients that you are a trained coach, and you have met the requirements to earn an endorsement from a credible training organization. Certification says that you are serious about your profession and that your clients can expect an excellent experience with you. Your certification strongly supports the coaching profession and you are contributing to its standardization and stability. Certification shows that you value connection and accountability and that you are willing to submit yourself to the scrutiny of a self-regulating profession. For onlookers (those who are either interested or critical), the more coaches who become certified, the more the profession is taken seriously. From the beginning, CCE’s vision has been to provide the finest coach training possible and to offer coach certification. A key step for accomplishing both of these goals was aligning our training standards with ICF requirements. Founded in 1995, the International Coach Federation (ICF) is one of the leading global organizations dedicated to advancing the coaching profession by setting high standards, providing independent certification, and building a worldwide network of credentialed coaches. With more than 20,000 members, ICF’s goal is to maintain a solid direction, presence and professional voice for coaches. Aligning our training standards with ICF gives you confidence that we uphold the highest standards in training and certification and offers you the opportunity to apply for ICF certification and CCE certification.